Before summer really is over, I thought it’d be a good time to post about my latest culinary passion: making ice cream. When I had envisioned people making their own ice cream in the past, I always pictured someone laboriously turning a crank on a wooden barrel filled with ice and rock salt and thought “oh, that seems like way more trouble than it’s worth!” But then came three fabulous food-filled days in February of this year on Isle au Haut, a small island off of Stonington, Maine. Yes, ice cream on a Maine island in February. Sounds enticing doesn’t it? Well, here’s how it went down. I was on the island for a whirlwind trip (more on this adventure later!) to do the photography for the fantastic forthcoming cookbook Desserted: Recipe and Tales from an Island Chocolatier to be published by Down East this fall. Kate Shaffer, a co-owner, with her husband Steve, of Black Dinah Chocolatiers, has penned a fabulous book full of humorous stories and knock-out chocolate-centric recipes. 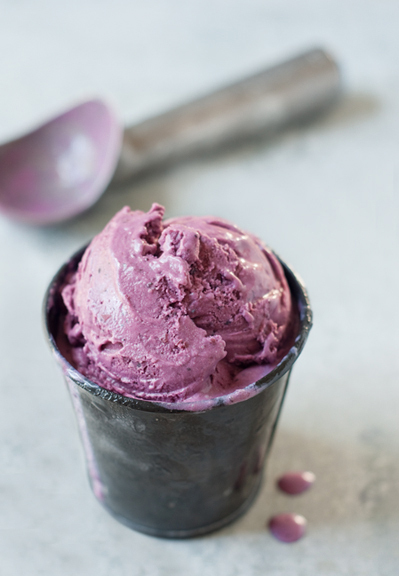 The book contains four ice cream and sorbet recipes. I saw her making one of them, the Maine mint chocolate chip, and was captivated. She put the mint-infused custard she had made earlier into her cute, little ice cream maker, which to my delight did not have a giant crank or a pile of ice. It had a frozen metal cylinder that is placed into a plastic container with a small plastic handle that she easily spun around a few times every 4 minutes for 20 minutes or so. Then the ice cream was placed in the freezer for several hours to set. Easy as could be. (The only potential stumbling block is planning far enough in advance so that your custard has time to cool thoroughly overnight in the fridge and then the ice cream has time to freeze solidly.) There are also electric ice cream makers that presumably make the process even easier, but I like the low-tech crank method because that’s just the sort of gal I am: one who appreciates things that are less likely to break down, less noisy, involve you more in the process and all that good stuff. And then I tasted that ice cream. And wow, I was in love. It was better than any ice cream I’d ever purchased anywhere. It was fresh and creamy and had a perfect balance of flavors. 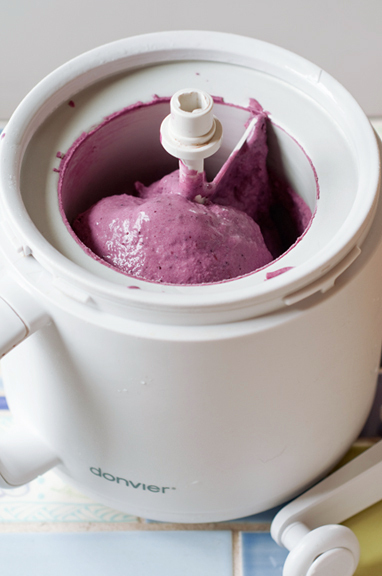 I vowed to get my very own cute, little ice cream maker as soon as the temperature rose above freezing. Since May I’ve experimented with several recipes. 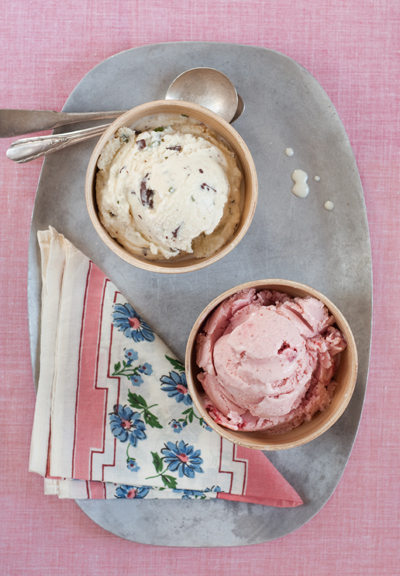 Among my favorites so far, aside from Kate’s Maine mint chip, which is still at the top of the list (the recipe can be found in Desserted come October), are salt caramel ice cream, strawberry ice cream, blueberry ice cream and sweet corn gelato. I like making ones that feature foods that are in season in Maine because the ice cream tastes that much more fresh and flavorful. Most of the recipes are very simple and involve making a custard from milk and eggs, which means after mastering the basic process it should be fairly easy to make up your own recipes. I haven’t done this yet, but I plan to! There’s also a new book out called Jeni’s Splendid Ice Creams at Home that uses a different method, not involving custard. I’ve heard good things about it and am eager to check it out. 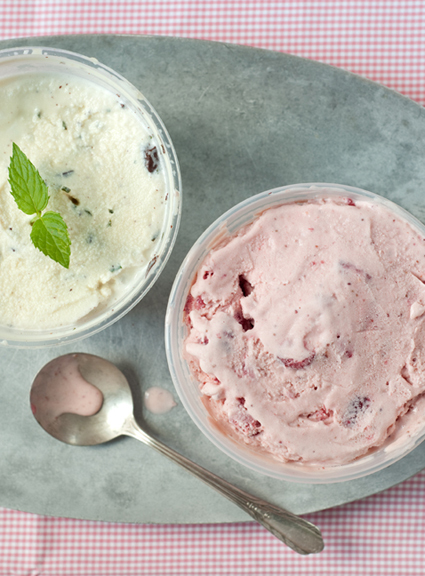 Let me know if you have any favorite ice cream flavors or recipes you’d like to share, especially before summer is over! This entry was posted in Down East, food, Make the Basics, recipe and tagged Black Dinah Chocolatiers, cookbook, Desserted, Down East Books, ice cream on August 23, 2011 by Stacey Cramp. Thanks for the nod, Stacey! Your ice creams look fabulous!